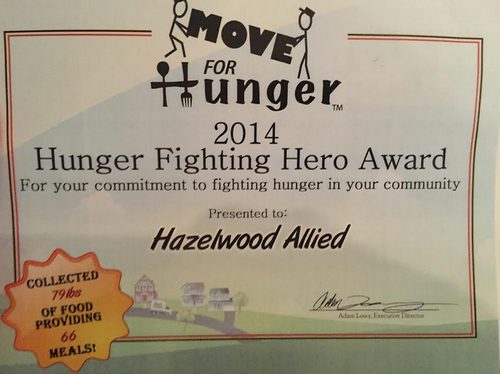 FOR IMMEDIATE RELEASE, December 23, 2014, Santa Barbara, CA Hazelwood Allied Moving and Storage was awarded the 2014 Hunger Fighting Hero Award from Move for Hunger Food Drive for contributing boxes to hold the donations and transporting them to the Foodbank location. Santa Barbara Community College students helped organizing the food drive on campus. Collections were donated to the Foodbank of Santa Barbara County. “We’re thankful we have the resources to assist in the carriage and transport of the donations these students are able to collect. Feeling helplessly hungry is a painful experience to endure, and we're glad our contributions made an impact,” said Casey McCann, co-owner of Hazelwood Allied. Move for Hunger teams up with moving companies across the country to move unwanted, non-perishable food items from those who are moving and deliver it to their local food banks. As an affiliated mover, Hazelwood Allied is also available to assist those who are relocating by collecting their unwanted food items that can go to help a family in need instead of going to waste. To find out more, contact the Hazelwood office at (805) 963-4493.